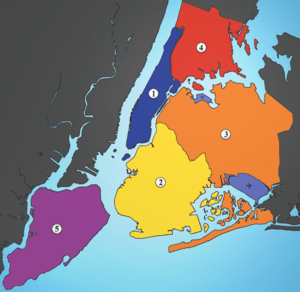 HURRICANE IRENE NEWS FLASH: The City Of GREATER New York Is Bigger Than Just Manhattan! As a native-born Brooklynite, I’ve been watching the networks and cable channels covering Hurricane Irene as it bears down on the northeast, and specifically the reporting on the City of Greater New York (its formal name) and Long Island. From this coverage, you would think that New York City is comprised of New Jersey and Lower Manhattan; particularly the Battery & World Trade Center areas. News Flash: There are 8 million people in the City of Greater New York, and over 6 million of them don’t live in Manhattan. For that matter, most of the low-lying areas of the City of Greater New York are not in Manhattan at all. They’re in Brooklyn, Queens, and Staten Island. Science matters. Discovery, understanding, application, improvement of our lives and our society; none of it happens without science, and science doesn’t happen without both money and the ability of scientists to follow their evidence wherever it leads them. The National Oceanic and Atmospheric Administration (NOAA) is seeking public comment on a draft of its scientific integrity policy, which aims to protect science and scientists from political interference. While the policy represents significant progress, it can be further strengthened to ensure that policy decisions are fully informed by the best available scientific information. File a public comment asking NOAA to strengthen its draft scientific integrity policy. In the past, NOAA scientists were censored and told to change their research on issues from global warming to endangered species. While the draft policy would address some of these problems, it needs to be further strengthened to better protect those who report the abuse of science, give the public more information about who is meeting with NOAA officials, and allow us to hold agency officials accountable if they transgress. It is critical that NOAA scientists can continue to provide national weather forecasting, manage coastal and deep ocean resources, and research global climate patterns without interference. Help NOAA improve its scientific integrity policy by submitting a comment today–the deadline is August 20. Please make your letter personal by adding in your own thoughts and concerns. Every letter makes a difference, but customized letters have the greatest effect! You can find the full text of NOAA’s draft policy here and view NOAA’s scientific integrity webpage here. We have outlined some areas for improvement in NOAA’s draft scientific integrity policy that may be helpful to reference when drafting your own comments. Read our draft comments (pdf). You can click on this link to go to the participation page. John Cleese: The Joys of Extremism! Below is an email from Mark Corcoran of Progress Texas, who created a petition at SignOn.org that is getting a lot of attention and may be of interest to people in your area. If you have concerns or feedback about this petition, click here. The Sons of Confederate Veterans want to display the Confederate flag on Texas license plates. You can do something to stop that right now. The Texas Department of Motor Vehicles must decide whether to allow this racist relic to appear on Texas license plates, but the TXDMV board is currently deadlocked with a tie vote of 4 to 4. Governor Rick Perry must now appoint a ninth member who will be the deciding vote on this controversial issue. The text above was written by Mark Corcoran from Progress Texas, not by MoveOn staff, and MoveOn is not responsible for the content. This email was sent through MoveOn’s secure system, and your information has been kept private. Progress Texas did not pay for this—we never sell or rent the MoveOn list. I recently received a typical self-laudatory and self-justifying email from one of my Texas Senators, John Cornyn. (Reproduced at the bottom.) Below is my response, posted to his office via his official web site. We do not need a balanced budget amendment. We need senators and representatives who can do their jobs. Leaders who know when to raise taxes, and when not to. Leaders who put country ahead of party and politics. Leaders who don’t make defeating their political opposition “the number one priority”, ahead of jobs, the nation’s debt rating, or our country’s future. I have just one number to say to you: 1937. You, sir, are among the worst examples of Republican “party first” politics. For over three and a half years, Vermonters and people throughout this country have experienced the worst economic crisis since the Great Depression. Millions of Americans, through no fault of their own, have lost their jobs, homes, life savings and ability to send their kids to college. Small businesses have been unable to get the credit they need to expand their businesses, and credit is still extremely tight. Wages as a share of national income are now at the lowest level since the Great Depression with workers who still have jobs working longer hours for lower wages. Meanwhile, when small business owners and Vermonters were being turned down for loans at private banks, the Federal Reserve provided trillions of dollars in loans at nearly zero interest to the largest financial institutions, major corporations and some of the wealthiest people in the world with virtually no strings attached. I hope for nothing but success for you in the years to come.